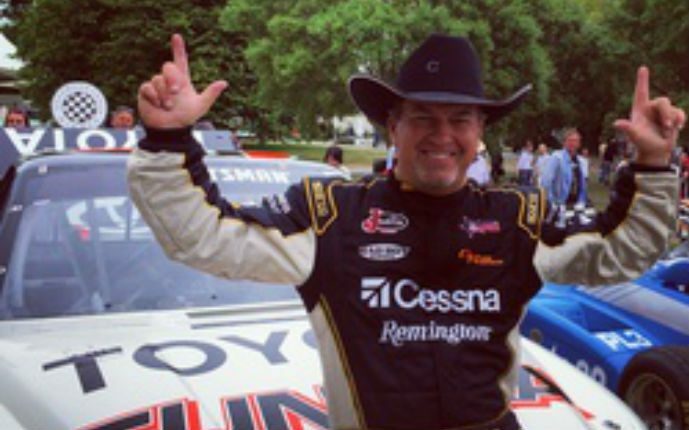 HUNTERSVILLE, N.C. (June 9, 2015) – Former NASCAR Camping World Truck Series (NCWTS) champion Mike Skinner will return to the Goodwood Festival of Speed for the fifth time in his career. Looking to improve the record time he set on the course in 2014, Skinner will return to this year’s Festival with a Toyota Tundra truck in the NASCAR class. Skinner, along with good friend and business partner Andrew Franzone will return to the Goodwood Festival of Speed with two trucks, both carrying the No. 5 that represented so much success throughout Skinner’s NCWTS career. The team’s first truck will run the historic No. 5 Toyota Tundra paint scheme that Skinner raced in the NCWTS from 2004-2008. After Skinner used the truck in 2014 to break the record time at the Goodwood Festival of Speed, the team will return with the same truck this year. This time, Franzone will be behind the wheel as the historic No. 5 makes its run. The team’s second truck running the No. 5 paint scheme will showcase partnerships with Textron Aviation, Cessna, Beechcraft, Remington, Venus Manhattan / Los Angeles Galleries, Sentinel Real Estate Corporation, Forbes Private Capital Group, Maui Jim, Justin Boots, Charlie 1 Horse Hat Company, C&R Racing and Racecar Solutions. Additionally, a special decal for Hope For The Warriors will showcase the charitable organization that both Skinner and Franzone support. Prepared by Skinner and his two sons, Jamie and Dustin, Skinner will be piloting this second No. 5 machine and gunning for another record-setting time in the NASCAR class on the hill climb course. Both Toyota No. 5 trucks were purchased from Skinner’s former NCWTS team owner Bill Davis. In 2014, Skinner broke the record time for a NASCAR stock car to win the NASCAR division at the iconic Goodwood Festival of Speed also driving for team owner Andrew Franzone. Racing the 10th Toyota Tundra stock car ever built, Skinner paced the eight-car race against the clock to shatter the record formerly held by Rusty Wallace, and he completed the 1.16-mile hill climb in just 50.75 seconds. Hosted by Lord March at the Goodwood Estate in West Sussex, England, the 22nd annual event will feature every kind of car imaginable from the 1800s through today and will attract some of the most accomplished drivers in motorsports. From the NASCAR garage, this year’s Goodwood Festival of Speed will also feature NASCAR Sprint Cup Series cars from Richard Childress Racing and Michael Waltrip Racing. Additionally, Richard Petty, “The King”, will showcase his famous Plymouth Superbird. This year’s Goodwood Festival of Speed will take place June 25-28, 2015. Follow @MStheGunslinger, or SkinnerRoundUp on Twitter, Facebook or Instagram for news and updates throughout the event.